An hour’s drive to the East from the Netherlands is the German city of Münster. Right in the middle of its historical centre there is the gothic town hall. And next to it is the Gruetgasse (Gruit Alley). 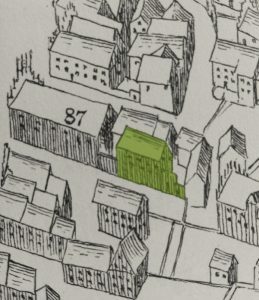 At the end of it, behind the town hall, there used to be the gruit house, until 1867-1868. 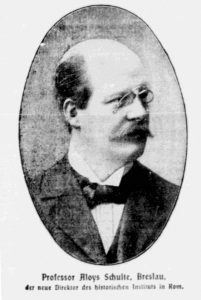 In 1908 historian and archivist Aloys Schulte could still remember how he had often entered its big hallway as a child. And when he asked his father what exactly this ‘Grut’ was, his dad would simply say: ‘That is the beer they used to brew.’ Many years later Schulte would write an article in which he tried to shed more light on that gruet, grut or gruit. A very interesting article that, despite being over a century old, tells us many useful things. Schulte himself had done research in the city archives of Wesel, a town on the river Rhine, which contained a whole package of gruit accounts. Schulte combined his findings with various other literature available at that moment. However, so far, especially in the Netherlands, not much attention has been given on what German sources tell us on gruit. In his 1955 book Doorman reproduced some information from German literature, but Hans Ebbing in his thesis Gruytgeld ende hoppenbier hardly devotes a word to Germany. In short, this provides a lot of insight. Of course, the research is over a century old, and it would be worthwhile to examine the sources again, and more thoroughly. This, for one thing, has already happened for Münster in 2002. 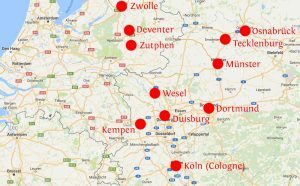 There is even more information available than shown here, because for instance Schulte admitted he had not looked at the gruit accounts of Kempen, a town near Duisburg. On the other hand, some sources may not be available anymore, as for instance a part of the Wesel archives were destroyed during the Second World War, and in 2009 the city archive building of Cologne collapsed, causing the historical documents to disappear into a hole in the ground (no joke). It is quite clear that the various herbs and spices were the main ingredient of gruit. In a few cases, the gruit house also bought malt and/or peat, which I shall talk about later on. In any case gruit always contained either bog myrtle (Rhine area) or ‘porsch’ (Westphalia). This ‘porsch’ has sometimes been identified as wild rosemary, but it could also simply be another word for bog myrtle; this will need some additional research. In any case bog myrtle and ‘porsch’ were never used simultaneously and they shared similar properties. Other main ingredients were the ‘bekeler’ (becler, beckeler, becheler, baccae lauri) and the ‘serpentien’ (scharpe tonge, scherpentangen, sermentangen, sermontaine, siler montanum). 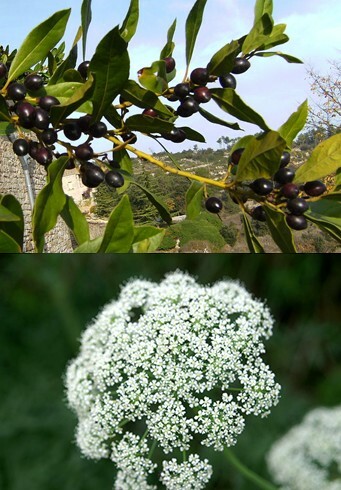 The first one is identified as the laurel berry, the second one is explained by Schulte as the Laserpitium Siler, a plant that grows mainly in the Alps. In English it is called ‘laserwort’. Incidentally, Dutch historians Van Vilsteren and Ebbing saw in ‘serpentien’ only a very non-specific ‘slangenkruid’ (‘snake herb’). The other ingredients are more puzzling. It is clear what is meant by resin, but was it added to gruit, for instance to improve its durability, or was it used to make the barrels water resistant? 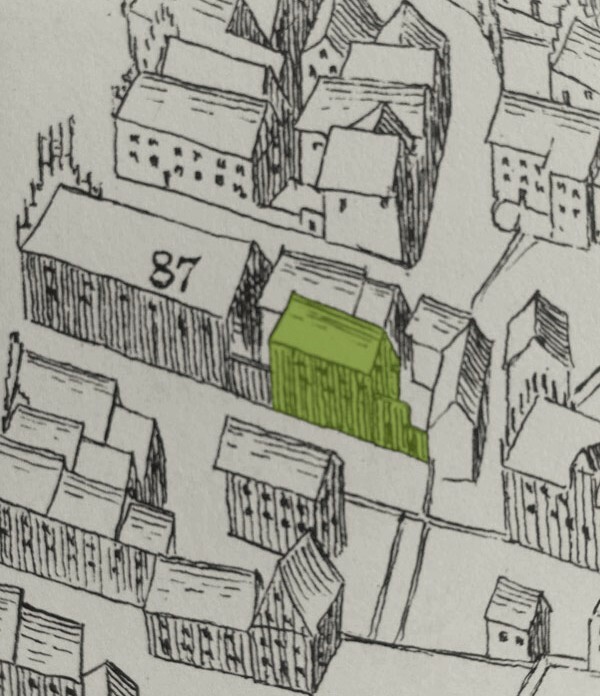 Are the ‘kerse’ in Duisburg cherries (‘kersen’ in Dutch, ‘Kirsche’ in High German), or are they candles (‘Kerze’ in High German) used to illuminate the gruit house? Is the ‘koemps’ in Cologne really caraway? 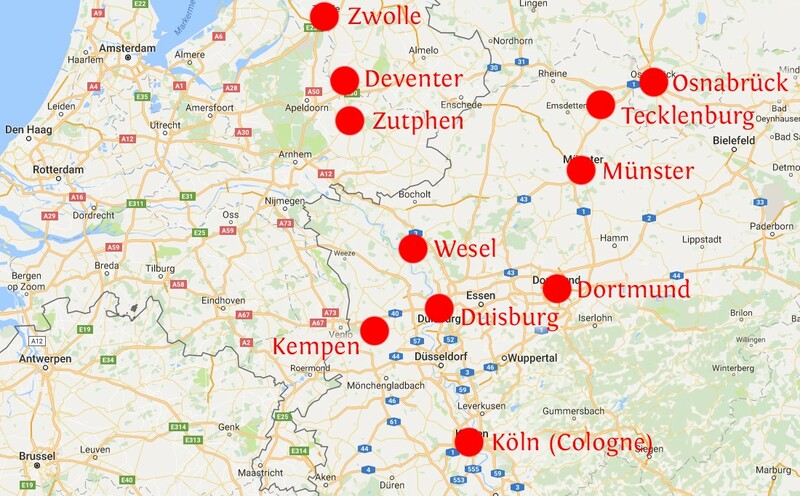 And can the ‘verzen’ in Duisburg and Osnabrück be read as wheat (‘Weizen)? There’s still some more research to be done. Places where gruit documentation has been found, mentioned in this article. Interestingly, Schulte’s article debunks a widely spread misunderstanding: that the gruit herbs were obtained from the immediate surroundings. When talking about, gruit, it is often assumed that it was a question of simply walking out of the city gate with your basket, and then spend an afternoon in nature picking flowers. That is not how it worked: although bog myrtle did occur in the Wesel region, to make gruit the town bought its bog myrtle in the cities of Zwolle, Deventer and Arnhem, occasionally in Utrecht. Apparently, the best bog myrtle came from the peat bogs in Drenthe and Twente. 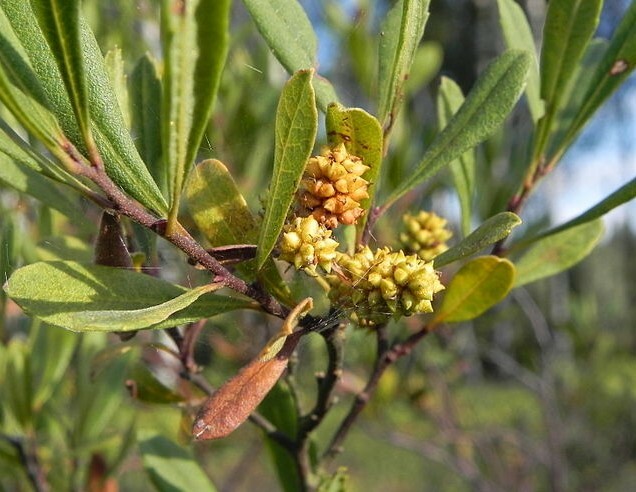 In Deventer they would sometimes buy bog myrtle in Zwolle, Amsterdam, Utrecht and Leiden. 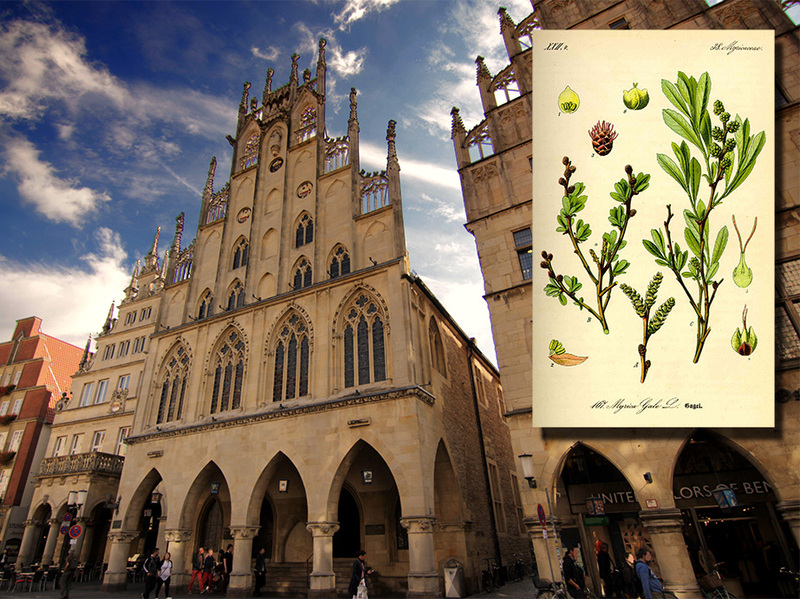 The laurel berries and the serpentien/sermontaine came from elsewhere as well: Deventer bought them in Arnhem, Wesel bought them in Cologne, and in later times Münster would buy them at the great spice market in Antwerp. In Wesel and Duisburg also the resin was obtained from Cologne. If you think about it, it’s easy to see why gruit could be made into a monopoly: the herbs came from elsewhere and they were expensive. That’s why, for instance, in 1444 the city council of Münster decided to raise the price of gruit, because the ‘krude’ (herbs) that ‘belonged to the Grut’ were so expensive. The profits made on gruit were considerable. In Wesel almost 20% of the revenues from gruit were pure profit; these benefits made up about 23% of the city’s total income. In any case the cost of the spices was much higher than that of hops, which can be seen in 1390 in Dortmund, where ‘porsch’ was four times more expensive than hops! In Deventer bog myrtle was three times as expensive. It’s not hard to see how much more attractive in price hops must have been for the brewers of those days, and why they were happy to switch over. As is well-known, brewers gradually replaced gruit by hops. From 1321 onwards beer was brewed with hops in Holland, after the example of Hamburg and other northern German cities. 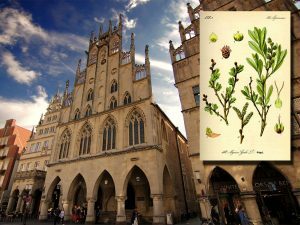 In the Low Countries and in the lower Rhine area gruit disappeared in the course of the fifteenth century: by 1423 no gruit was used anymore in Leuven, in 1437 it was noted in Delft that it had been in disuse for years, and likewise in 1468 in Gouda. Oddly, gruit was employed a bit longer in Cologne and in Westphalia. In Dortmund, where already in 1390 the gruit house purchased hops, the city only ceased the production of gruit in 1544. The next year however, gruit was being made again at the request of the nobility, pregnant women, townspeople and the monks at Cappenberg. In Osnabrück ‘Grusink’ (gruit beer) is supposed to have been brewed right until the beginning of the Thirty Years War (1618-1648), but already in 1456 the gruit there was described as ‘bad’, and at the end of the fifteenth century of the 63 brewers in the city only one was known as a ‘Grusing brewer’. In Münster the last Grüsink disappeared in 1590, and interestingly it was replaced by a beer called ‘Koit’, a strongly hopped barley and wheat beer; in it we can recognise a variant on Dutch kuit beer. The last gruit beer seems to have been that of the small town of Tecklenburg. In 1661 the Groningen-based professor Maarten Schoockius wrote about the ‘Gruising’ that was made there, a beer made without hops, but it did contain the classic ingredients of gruit: ‘porsse’ or bog myrtle, laurel berry and ‘Scharpe tonge’. Schoockius even mentions the eyewitness who told him about it, a ‘very learned young man’ called Wilhelmus Snethlage. One last problem is the purchase of some malt and peat by a few gruit houses, however in too little quantities to actually brew beer from it. Of the gruit house in Deventer, and those in Zutphen, Zwolle and Ouddorp, it is also known that there was a kettle. This has led to various assumptions that gruit was more than just a herb mix crushed at the gruit house. For instance, it has been suggested that malt was added to conceal the secret recipe. Hans Ebbing came up with the theory that gruit was a ‘powerful malt extract’ that made mashing (the formation of sugar from starch) easier. That doesn’t seem logical: a gruit house could have made such an extract only from unmalted barley, by malting it themselves. Instead, it is clear from the sources that the gruit houses bought malt, not barley. Also, the idea has been formulated that gruit was a combination of herbs and boiled-down wort, a sweet substance that could be used to stimulate fermentation. However, so far this idea has only been defended with completely inappropriate arguments, so it was relatively easy to debunk them. The most powerful evidence in this matter still is that gruit was so quickly replaced by hops as soon as it was possible, something already remarked upon by contemporaries. This demonstrates that the function of gruit must have been similar to that of hops, which is to give the beer a spicy taste. That is also obvious from the description of the last gruit beer, that of Tecklenburg, of which herbs were clearly the defining trait. 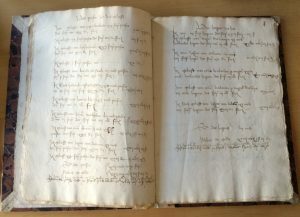 The purchase of malt and peat at the gruit house may have served to supply additional products, such as the puzzling ‘gruetsoppe’ and ‘medulla bracii’ sold in Deventer. To summarise, the conclusion is simple: the available sources tell us quite a lot about the ingredients of gruit. It always contained spices, especially bog myrtle (or ‘porsch’), laurel berry and serpentien/sermontaine, which probably corresponds to laserwort. It would be a good idea to do more research on gruit, but the documents available in Germany should be the first sources to be looked at. In the Netherlands the sources, namely those from Deventer, Zwolle and Zupthen, have long been exhausted. Did this make you thirsty? Then you should consider travelling to Münster, where lately a ‘Gruthaus’ has been re-established. That is to say, a guy called Phillip Overberg has recently started a brewery with that name. And yes, he also makes a gruit bier, a ‘Grut’ with bog myrtle, juniper berry, caraway and hops. Ein Prosit..! Derived from Schulte, ‘Vom Grutbiere’; Mitteilungen des historischen Vereins zu Osnabrück, 10 (1864), p. 31; Wilhelm Scheben, Die Zunft der Brauer in Köln in ihrem inneren Wesen und Wirken, Keulen 1880, p. 106-112; Ludwig Stiefel, Die Duisburger Stadtrechnung von 1417, Duisburg 1883, p. XXII-XXV, LXV-LXVI; Karl Rübel, Dortmunder Finanz- und Steuerwesen, Band 1 (Das vierzehnte Jahrhundert), p. 185-189; R.E. Kistemaker and V.T. van Vilsteren (red. ), Bier! Geschiedenis van een volksdrank, Amsterdam 1994, p. 20-27. Schulte, ‘Vom Grutbiere’, p. 128-129; Kistemaker and van Vilsteren, Bier! Geschiedenis van een volksdrank, p. 22. Raymond Van Uytven, ‘Haarlemmer hop, Goudse kuit en Leuvense Peterman’, in: Arca Lovaniensis, jaarboek 1975, p. 334-351, here p. 338; Richard Unger, A history of brewing in Holland 900-1900. Economy, technology and the state, Leiden/Boston/Keulen 2001, p. 41-42. Kistemaker and van Vilsteren, Bier! Geschiedenis van een volksdrank, p. 25; also the Zupthen gruit house purchased malt, cf. Ebbing, Gruytgeld ende hoppenbier, p. 24. Cf. my comments on this theory in R. Mulder, ‘Further notes on the essence of gruit: an alternative view‘, in: Brewery History 169 (2017), p. 73-76. Kistemaker and van Vilsteren, Bier! Geschiedenis van een volksdrank, p. 27. Possibly, there may be something to be found in Belgium as well, for instance the city archives of Ieper supposedly contain sources on gruit; information kindly provided by mr. Guido Vandermarliere on Facebook.